Personally, I consider R.E lessons a great opportunity for exploring new ideas and can be very interesting. No child is too young to ask a question or share an opinion that leads to all sorts of healthy class debates and wonders. Equally, thinking back to some of the R.E. lessons I had as a child, there is a risk that they can be quite boring. Gathered on the carpet, I read the story to the children stopping every now and again to check for their understanding, also asking various individuals to recap the order of events. Following a discussion about the story we looked at some online images portraying the Pentecost and talked about how different artists had represented the story in different ways and what the different elements in the paintings might represent. Then, I put the children into groups and they each selected a character or two from the story. They created a puppet for their character/characters from card and stuck them on a stick (having discussed what type of clothes they would be wearing- no skinny jeans and ugg boots etc! When I asked why not? “Because they wouldn’t have been in fashion then!”). Finally, in their groups the children recreated the story of the Pentecost as a puppet show. It was great to see how many of them remembered the key events and even some key phrases from the version I had read to them. I even took photos of each group’s puppet show for their teacher to see the next day (would love to have videoed but couldn’t find any equipment in the school at short notice). The children really seemed to enjoy the whole afternoon, asking lots of questions and getting very excited over their puppet shows. They were engaged through art, design , speaking and listening and R.E. all at the same time! A great way of making R.E. cross-curricular and bringing the story to life for the children. 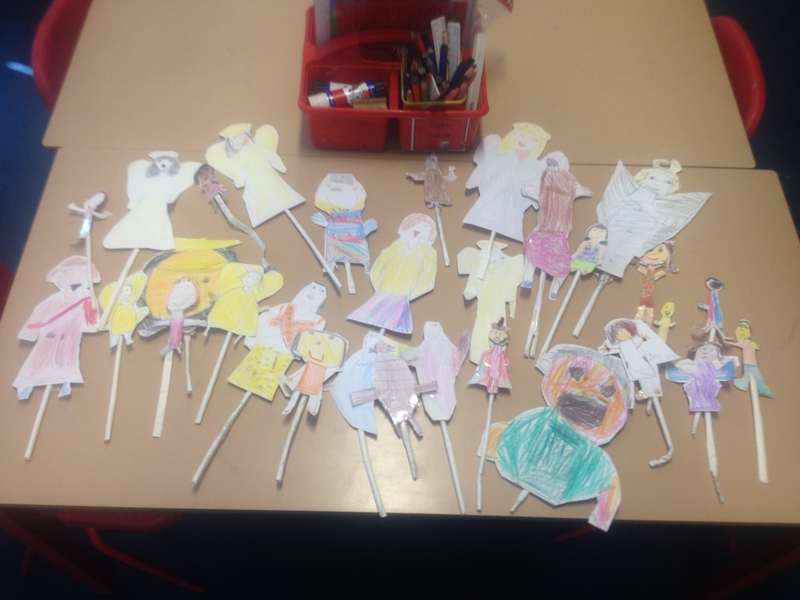 This entry was tagged cross curricular, KS1, lesson, primary, puppets, R.E., religion, school, supply, Teacher, teaching. Bookmark the permalink.